I am not a worrier all that much or the things I do worry about are things that in the grand scheme don't matter that much but 1 thing I do think about often enough and worry about some is (especially when it's something seeming new or uncertain) will my drs. think I'm making something up? Will they (do they?) believe me? I can't really say why that's something I think about but I do and I guess maybe it comes from all the days when no one knew and from time to time I did get a dr. who in as many words questioned what I said and/or felt. I am wide awake (but certainly tired!) at 5 in the morning, this Rare Disease Day, many things on my mind and some iffy/odd/weird symptoms occurring (very) intermittently over night and it ALWAYS makes me cringe! I'll wait to say anything, see if symptoms con't or not but to this day I STILL hate calling drs offices, trying to explain something (I will be 1st to say I often struggle trying to explain symptoms or how I am feeling or if something different what it is exactly. Hopefully in this case the symptoms where just a passing thing! It is RARE Disease Day (capitalized b/c come on it's RARE DISEASE DAY!) 12 yrs ago this day didn't exist so it's a pretty neat day to me, even if all i'll be doing is driving my sleepy self to infusion, working on paperwork and phone calls and 6ish hours later driving myself home (to hopefully crawl in my pj's and go to sleep I hope!) On this Rare Disease Day I am grateful to have this infusion and even if it's an (basically) entire day 1 day of every wk, week in and week out I am GRATEFUL I have a treatment and to that better treatments are being studied and in studies! None the less, if you are healthy be grateful. If you know someone with a rare disease, wear your jeans (for genes, the faulty errors for those of us with genetic issues in my case the error falling to a single gene (4p16.3) which was something both my Parents happen to be carriers of)! 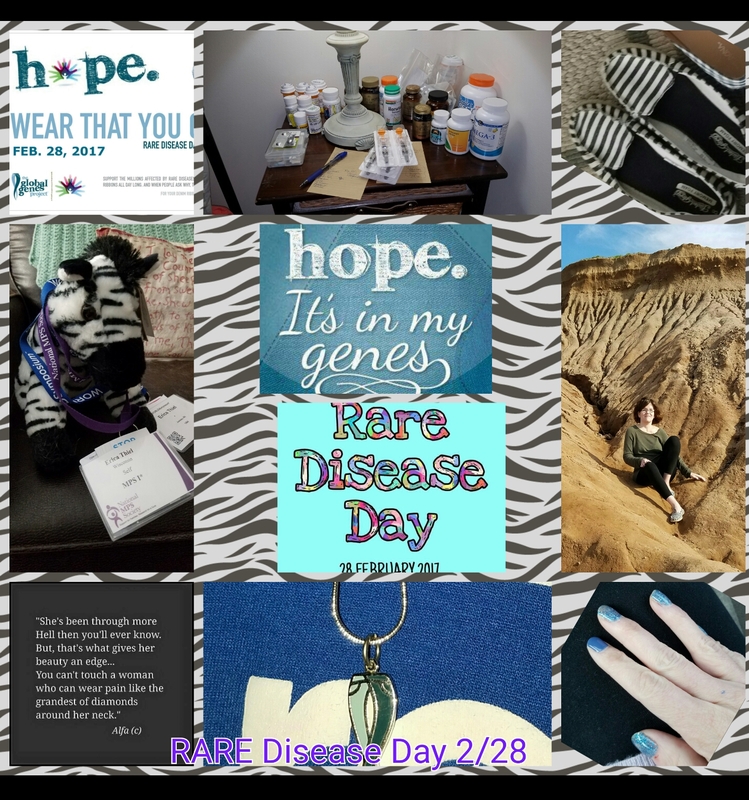 And if you are like myself walking around with a rare genetic disease well then celebrate this day in some form or another as we are alive and though some or many days may be difficult we've made it so far! ps a year ago earlier this week., I had heard from Dr.Bragg that she'd accepted the position in AZ at PCH. I can still remember how I felt, how many times my Providers said to me after that (and still say from time to time) they didn't know how to replace her and "there will never be another Neurosurgeon like her". Doesn't mean other drs. aren't good just that she was mighty special for her field! Reading the various things I wrote that day and the days after was a little heart wrenching (I was so scared, undertain, afraid I think) but I also wrote that I couldn't wait for it to be a year from then honestly for the simple reason that things would be better settled, I'd know who my Neurosurgeon was going to be and almost above all I'd know or have a better idea of what things would be like. I am glad it in fact is a year now! I miss her terribly but she's thankfully has in fact kept in touch. I'm working w/her former Partner now and though that's not always been the smoothest (I guess she just was a good listener, she didn't try to pretend she understood it all but she learned). - Things will get better with the Neurosurgeon I see now, he's told Dr.Bragg and I he's glad her and I keep in touch as she helps both of us. Above all I get it, he's just a different personality type than she was, but if he tries I can keep on trying to. Just forgive me when I get frustrated and when I feel like I'm banging my head on a wall. It's simply b/c I want to sort things out and most of all, above all I just want to feel better (head is pretty good, the leak makes a huge difference, it's the low to mid back radiating pain and the deep-again radiating pain down my R side and at times now when on my feet my L side as well. God has a plan, right? Another year from now, God willing who knows what will all have occurred, what i'll be up to and what better things may in fact be an option or closer. God willing! ps It may be to late but wear your jeans or wear your blue!